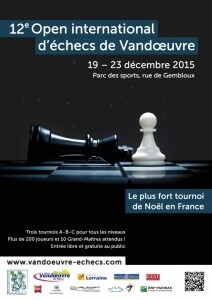 12th International Vandoeuvre Chess Open 2015 takes place in Nancy, France between December 19 and December 23 2015. 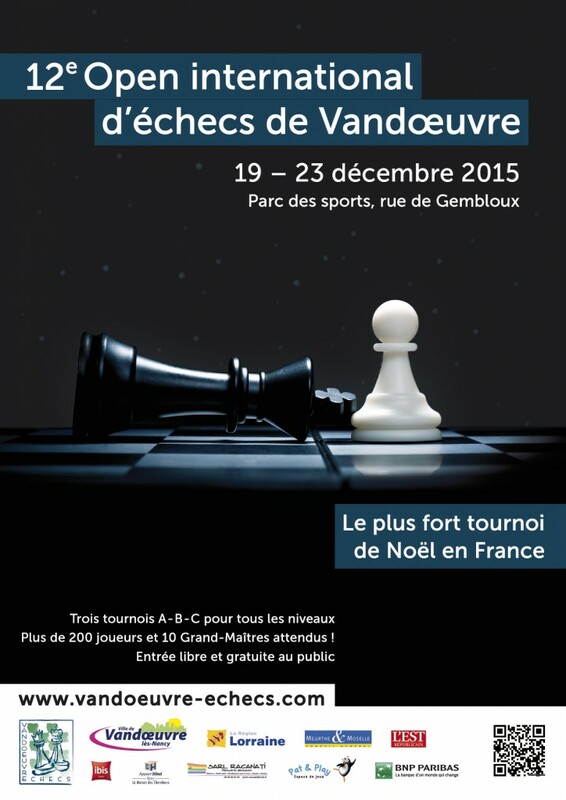 The strongest Christmas tournament in France is being held for the 12th time. It features nearly 300 players from 23 different federations that will play 9 rounds of chess in three different sections – A, B and C – based on ELO. There are 221 representatives from France, the most numerable of any federation represented. There are 9 GMs and 3 WGMs taking part in the tournament, as well as 22 IMs and WIMs and 12 FMs. The top seeded player is GM Sergey Fedorchuk from Ukraine with 2641 ELO. The only other player in the 2600+ range is the French GM Christian Bauer. After Round 5, the sole leader in Group A is GM Sergey Fedorchuk with 4,0 points. He is half a point ahead of Alexander Donchenko, Christophe Sochacki and Tiegjie Lei who are tied for second place. In Group B, Kamil-Can Parlas (1873) is the solitary leader with 4 points.